What's way more fun than melted ice cream? These delightfully drippy bowls. Ice cream is a treat that never lasts long (we're lookin' at you, August sun). But these distinctive dessert bowls are anything but a rush job. Ceramic artist Brian Giniewski starts with raw, pigmented clay and then adds multiple applications of cool, pastel glaze. With repeated, computer-controlled firings over the course of a month, these layers of molten glass form a delightfully drippy effect that reflects the fleeting satisfaction of ice cream on a summer day. 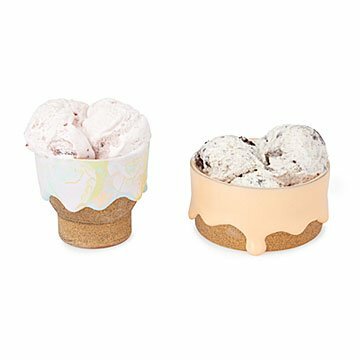 The results—a cone-like holder or sundae cup—are fun servers for your favorite scoops. Handmade in Philadelphia, Pennsylvania. Hand wash, do not place in microwave or dishwasher. Love the bowl! Packaged excellently for shipment Andy arrived in perfect condition! The only thing that I'm ehh about is the rough texture of the bottom of the cone itself. It almost has a sandpaper texture - of course it's handmade and it doesn't feel mass produced - but just wish it had a smoother finish and it would be perfect! Perfect unique gift idea for someone who loves to eat ice cream. The bowl is big enough to hold a few scoops and is very high quality. Might have to purchase the other one to match the one I already bought!